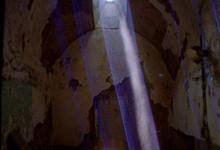 Combining hand-processed 16mm imagery, a deconstructed lyric essay by Erik Anderson, and an ambient score by composer Vicki Brown, The Blue Record meditates on the pastime of ruin-gazing and its application across a wide range of aesthetic experiences. 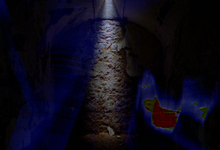 Informed in part by the work of Alain Resnais, Walter Benjamin, and the Romantic poets, The Blue Record is a collaborative study of what happens when the process of decay is arrested and ruins become commercial entities. 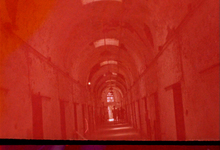 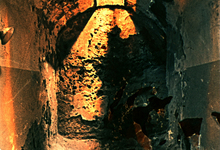 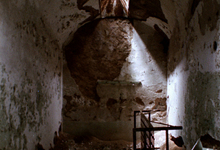 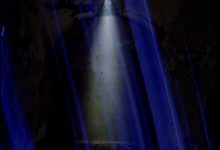 Shot on location at Eastern State Penitentiary in Philadelphia, the film is at once an immersive and Brechtian examination of the experience of destruction as an aesthetic pleasure.